As American Ferrari owners began to arrive at the “Ferraris on the James” event in Williamsburg yesterday, they saw the Secret Service and other White House staff running in and out of the Kingsmill Resort in Williamsburg, VA. To their surprise, they found out that President Barack Obama is also staying at the same hotel in preparation for the second TV debate with Mitt Romney on Tuesday. The Democratic candidate for the White House was hoping to get some quiet time to prepare for the debate in which he will square off with his Republican opponent. But the Ferrari owners may be keeping President Obama awake as they will “definitely make themselves heard” with their Ferrari’s powerful engines. The elegant hotel, situated directly on the banks of the majestic James River in Virginia, was chosen by Barack Obama because of it’s beautiful and serene setting. When the Kingsmill Resort assumed the host role of Ferraris on the James for 2012 event, they had no idea they would also be hosting the President of the United States at the same time. 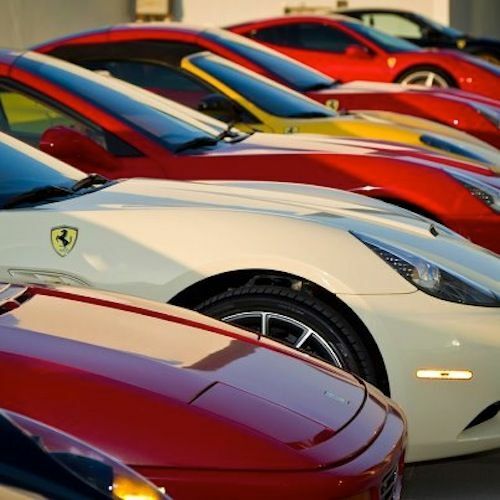 The American Ferrari owners didn’t come to the beautiful resort to get rest. It will be interesting to see if Obama will take a look at the high-performance supercars while he is at the resort preparing for the debate tonight. President Obama has just raised the CAFE standards that auto companies have to meet from the current 34.5 mpg by 2016, to 54.5 mpg by 2025. This is forcing automakers to come up with a number of ways to increase fuel-mileage in their fleets. Even Ferrari is making advances in fuel-efficiency and emissions in their high-performance supercars. Ferrari notes they have reduced fuel consumption and emissions in the new 2013 F12 Berlinetta by a remarkable 30 percent. This is partly due to increased overall aerodynamic efficiency, which they say is the highest of any Ferrari ever built. Even with its 730 horsepower, Ferrari is working on fuel-efficiency. While the Ferrari owners gather to celebrate their luxury performance cars at the “Ferraris on the James” and make themselves heard, President Obama is getting ready to talk about limiting our dependence on foreign oil and retooling the auto industry. I wonder what kind of a reception he will get from the American Ferrari owners? I would like to be behind closed doors at their meetings and hear their discussions.